While Apple still dominates the tablet market, sales of all such devices have fallen worldwide, according to data from market research firm International Data Corp. The latest quarterly tablet tracker found shipments down by almost 9 percent during the third quarter of 2018. "Slate"-style tablets, which make up 87 percent of the market, shrunk 8 percent from the previous year; the remainder, "detachable" tablets, declined by 13 percent. However, IDC analysts said they believe that refreshes of devices from Apple and Microsoft, along with new products from Samsung and Google, could turn the detachable category around during the final quarter of the year. Last month, Apple introduced two new versions of its iPad Pro, 11-inch and 12.9-inch models, which went on sale this week, the smaller version starting at $799 for the WiFi edition and the larger one for $999 for the WiFi edition. Microsoft announced the Surface Pro 6 (along with a Surface Laptop 2), expected in 2019 and starting at $899. Samsung introduced a number of new products throughout the year, including a ruggedized Galaxy Tab Active2 for workforce use; an Android-based Galaxy Tab S4 for general business use; and a Galaxy Tab A 10.5-inch tablet, intended for home use. And Google will shortly begin shipping its Pixel Slate, a $599-plus Chrome OS device. 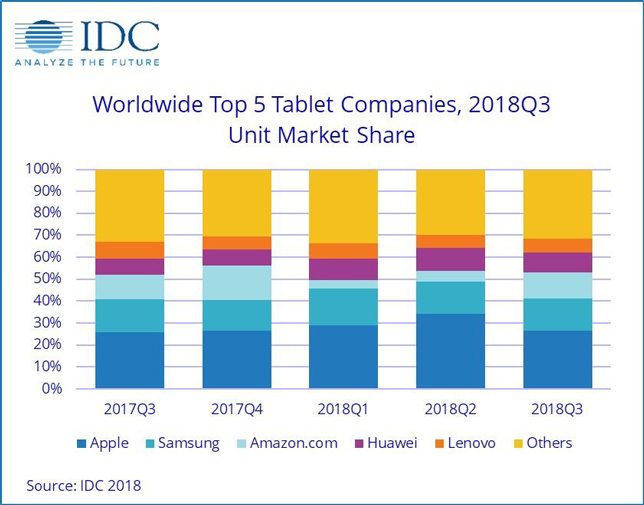 "The tablet market is more like the traditional PC market than ever before," said Jitesh Ubrani, senior research analyst with IDC's Worldwide Quarterly Mobile Device Trackers, in a statement. "Not only do these markets move in sync with each other, but the decreasing margins and overall decline, particularly in slate tablets, has led to the top five companies capturing a larger share as many small vendors have exited the space or simply treat the tablet market with a much lower priority." Ubrani said Apple and Samsung, which hold first and second place, respectively, in tablet shipments for the quarter, are the two companies that "continue to invest heavily in product innovation and marketing," helping each "to set themselves apart from the rest." Amazon, with its Fire line, was named the third largest tablet maker for the third quarter, according to IDC. The company shipped 4.4 million units in that period, compared to 9.7 million for Apple and 5.3 million for Samsung. The only company to register growth in tablet shipments year over year was Huawei (in spot number four), which saw expansion for its devices in Europe and Latin America, specifically. Lenovo, whose tablets span every possible category, saw shipments drop by almost 25 percent year-over-year. According to IDC, Lenovo has been "heavily focused" on extending its reach in the traditional PC market, allowing it to regain the top position in that market, while slipping to fifth place in the tablet market over the quarter.